Further voting in our latest FenwayNation Poll shows that a majority of readers (52%) now think the dual free-agency acquisitions of J. D. Martinez and Carlos Sanatana should be the top priority for Dave Dombrowski. 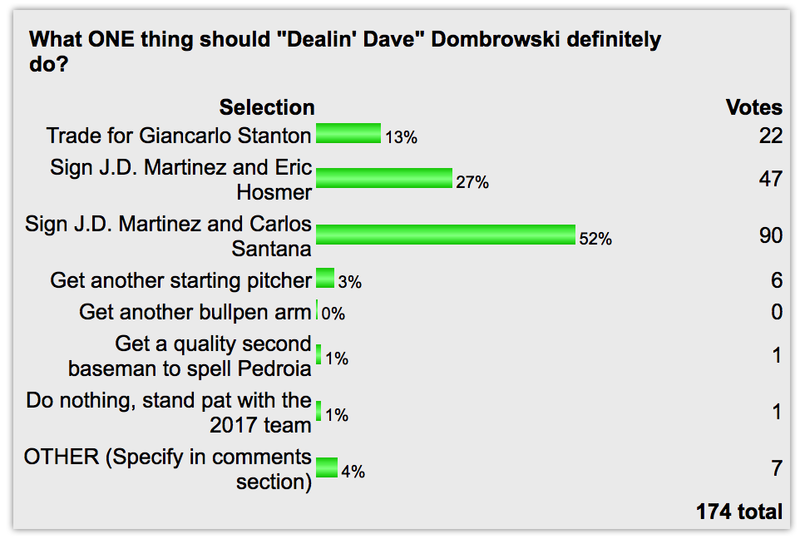 As the chart shows, 27% now believe that getting Martinez and Eric Hosmer should be the one thing 'DD' needs to do, followed distantly by a trade for Giancarlo Stanton (13%), getting another starting pitcher (3%), getting a second-base fill-in for the injured Dustin Pedroia (1%) and standing pat with the 2017 roster (1%). 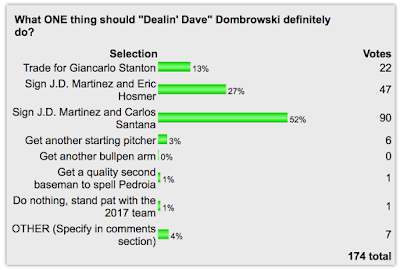 Just 4% want some other action by Dombrowski not listed in the poll. You can vote in the poll HERE.